The cross platform and cross Graphic Library UtilitieS (GLUS) is an open-source C library, which provides a hardware (HW) and operating system (OS) abstraction plus many functions usually needed for graphics programming using OpenGL, OpenGL ES or OpenVG. Visit GLUS repository on GitHub for the GLUS library source code. Visit OpenGL repository on GitHub for the GLUS library plus many OpenGL 3 and 4 examples source code. Visit OpenGL ES repository on GitHub for the GLUS library plus OpenGL ES 2.0, 3.0 and 3.1 examples source code. Visit OpenVG repository on GitHub for the GLUS library plus OpenVG 1.1 examples source code. GLUS is written in ANSI C and uses GLFW and GLEW for desktop OpenGL. For OpenGL ES and OpenVG on embedded systems or desktop simulations, EGL and platform dependent code and libraries are used. * Include GLUS. Needed OpenGL, OpenGL ES or OpenVG headers will be included depending on the build profile. * @return GLUS_TRUE when initalization succeeded, otherwise GLUS_FALSE and the application will exit. // The background will be just cleared with blue color. * Function is called before first update and every time when the window is resized. * @param width The width of the window. * @param height The height of the window. // Set the viewport depending on the width and height of the window. * Function to update and render content. Swapping of the buffers is automatically done. * @param time The passed / delta time from last frame. * @return GLUS_TRUE for continuing, GLUS_FALSE to exit the application. // Now, the background is painted blue. * Function to clean up things. // No resources have to be freed in this case. // Parameters for the used window surface. See EGL man pages for more info. // Parameters for the used context. See EGL man pages for more info. // Create the used window. See GLUS man pages for different parameters. // Enter the update render loop. 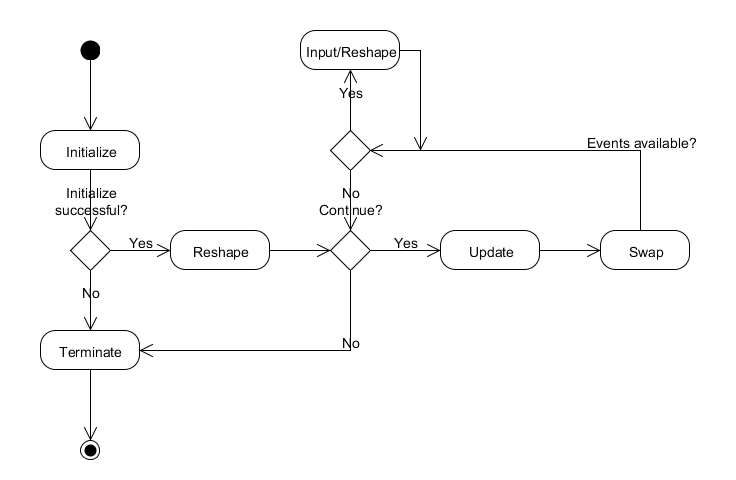 See below state machine for more information. Visit the GLUS man pages for the documentation of each available function. The source code is licensed under the GNU LESSER GENERAL PUBLIC LICENSE. If another licence is needed, please contact the author.